This summer, in the lead up to the launch of the new television show, “Star Wars Rebels”, Star Wars released numerous videos on YouTube to not only promote the upcoming show, but also to give fans an opportunity to get excited about the new show as well as to briefly familiarize them with it. Amongst these videos, four of them were categorized as “shorts”, lasting roughly three minutes and were posted primarily in August. When I had seen them, I thought they were excerpts from the upcoming show, which was a nice treat to get before the show actually debuted. However, now that “Star Wars Rebels: Spark of Rebellion” and the first seven episodes of “Star Wars Rebels” have aired, it has become clear to me that they are not actually part of the series and were, in fact, snacks for the hungry Star Wars fans to help us get acquainted with the characters. The four shorts initially aired on Disney XD on a weekly basis, 11 August through 1 September as well as posted to their YouTube channel. 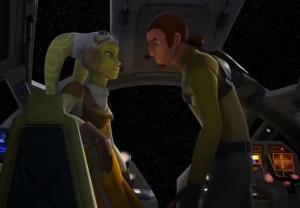 Do Hera and Kanan have something going on? 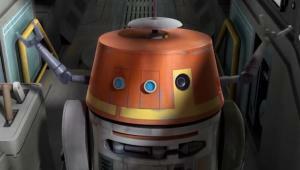 The first of these shorts, “The Machine in the Ghost” (aired 11 August 2014), introduces us to Hera and Kanan’s seemingly old-couple bickering with each other with Chopper, their droid trying to deal with them and their demands, ultimately resulting in him taking care of the matter at hand by himself. It’s a tense short, which results in an amusing and happy ending. In addition to getting a taste of Chopper’s attitude and personality, which is amusing and spunky, we also see that Hera and Kanan have strong personalities, and that they may have a history of being romantically involved (perhaps even still?). 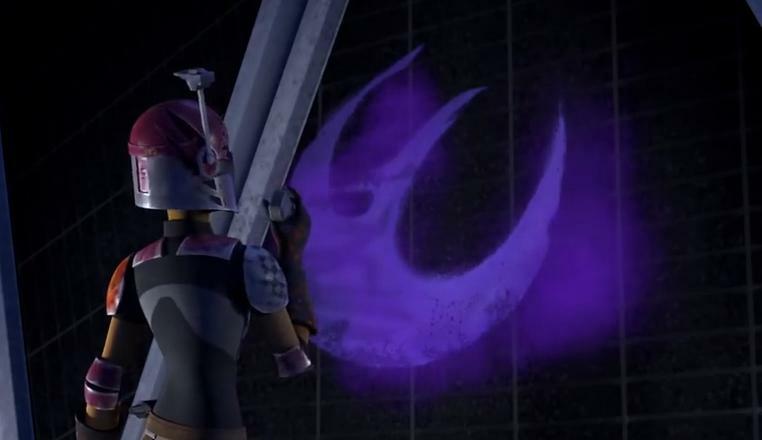 The second, “Art Attack” (aired 18 August 2014), introduces us to Sabine Wren, who infiltrates an Imperial base and plants many bombs throughout, while also working on her graffiti art, to the surprise of stormtroopers who find her and order her to stop. Through her nimbleness and acrobatics, she is able to evade them, all the while teasing them while planting bombs. Eventually, she escapes to the explosions of the various TIE fighters and other vehicles at the base with her marvelling at her artistry of not only the graffiti, but the colorful explosions, as well. We see that she greatly enjoys employing her artistic skills in graffiti as well as explosives and that she is youthful, playful, and nimble. 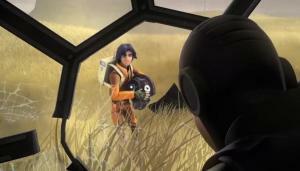 The third, “Entanglement” (aired 25 August 2014), is a relatively amusing, yet tense introduction to Zeb, who is supposed to meet up with Kanan and ends up in the wrong place when he sees a fruit salesman being roughed up by stormtroopers, so he kindly intervenes, although ends up getting spotted by other stormtroopers, so he runs away from them, winding up at a TIE fighter, with the final result being the TIE fighter blowing up and Zeb walking away from the stormtroopers. 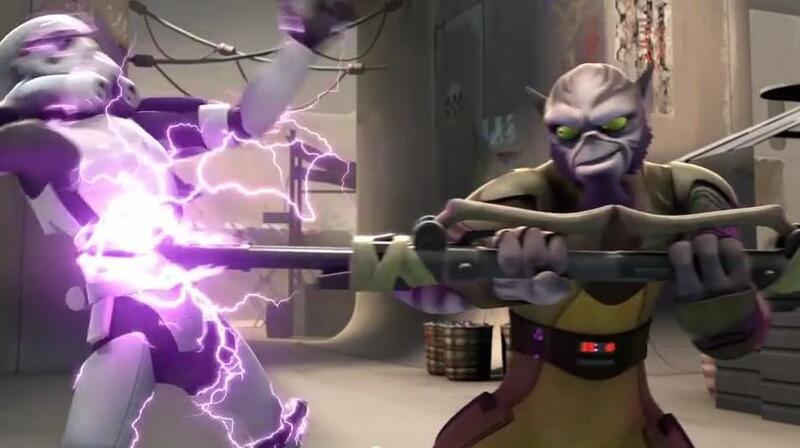 From this, we see that Zeb wants to help out fight the injustice of a defenseless salesman from stormtroopers harassing him and is happy to hop into a fight. 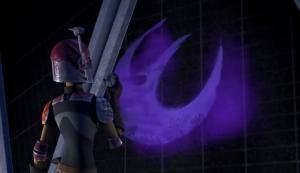 He also seems to have been imprecise in locating the planned coordinates of the rendezvous spot, so that may not be a strength of his, but, certainly, he has a great skill and confidence in his combat abilities. The fourth and final short, “Property of Ezra Bridger” (aired 1 September 2014), ends these four shorts on an amusing note. Ezra spots a downed TIE fighter and goes to ostensibly help out the fighter pilot, but is really there to pilfer from him, being very quick on his feet and, being young, is able to get away with being there. We see that Ezra cares not for the the Empire and that he likes to get some freebies from the Empire (whether for selling or for his collection). In all, they were nice to re-watch, now that the first set of episodes have aired.